Since its release in 1987 and subsequent updates, ISO 9001 has become the most recognised standard in the world today. Certification demonstrates to stakeholders that there is a commitment to quality management systems. The commercial reality is that many customers now expect, and tenders demand that suppliers implement best practice as outlined within ISO 9001. At ApprovalMark International we embrace the spirit of ISO 9001 by going beyond the requirements set out in the standard. Our clients benefit from a continuous improvement process for products and services that deliver results to the bottom line. Contact us and find out why the ApprovalMark ISO 9001 is different by adding real value within your drive for new business and customer retention.Click here to find out more about certification to ISO 9001: 2016. The deadline to carry over to the new standard is the 31st August 2018 as certification will cease to exist as at 16 September 2018. Hence your last surveillance audit will need to be completed by 31st August 2017. You can choose to transition at any time and we will work with you to identify the gaps you need to address to achieve the new certification. This may require additional audit time in addition to your usual surveillance audit. Download our self-assessment checklist to determine whether you are ready to transition to the new standard. The deadlines for applications is the 31st August 2017. This is to ensure that you are certified before the deadline of 31st August 2018. Download our self-assessment checklist to determine whether you meet the requirements of the new standard. As an organization, you would complete your application to AMI requesting certification to ISO 9001. Here AMI will provide all the necessary details and information required to prepare the organization for achieving this certification. At this stage, AMI will carry out an initial assessment of the organization and ensure that the organization is aware of the standards and the knowledge, skills and capability required to achieve certification. After the preliminary assessment report has been provided, a certification audit date will be organized to carry out a thorough review of the compliance of the implemented system to the standard. On completion of the Certification Audit, a comprehensive audit report would be distributed and reviewed. 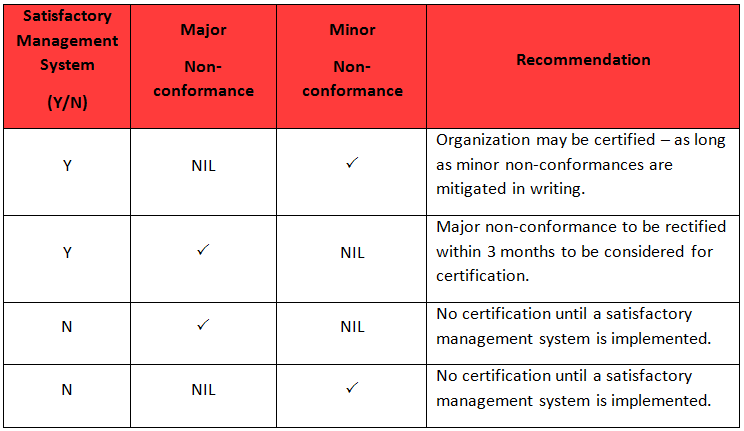 Based on the table above, if the organization is recommended for certification, a certificate license number will be issued with the registered ApprovalMark International Certification mark for display. The organization details would be then added onto the JASANZ Register. Once your organization is certified, the certification mark can be used to promote and grow your business. In this process, being able to maintain and optimize your management system is key. AMI assists you in this aspect by carrying out annual audits during the period of certification and providing reports to assist in the improvement of your management system. Your assigned client manager is always available to discuss your plans and certification needs to ensure that the company is always maintaining its prestige of being a ISO 9001 certified organization. Re-certification of your management system is required every 3 years and covers a comprehensive review of the whole system. If any significant issues have been identified during the certification cycle, this may be reviewed during the re-certification process. Our commitment is to ensure our clients are happy with our service as ApprovalMark International prides itself on having un-paralleled customer service. You are not a number but a valued client, so we value your business with us and we go that extra mile to provide service to you whenever you need our assistance.